ironing board facelift | lots of pink here! I know I've been missing for a few days, sorry! Penelope started back to preschool this week and we have been running around like crazy! 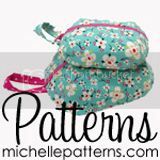 So, I am a total impulse pattern buyer, fabric too sometimes though that is usually a little more thought out! 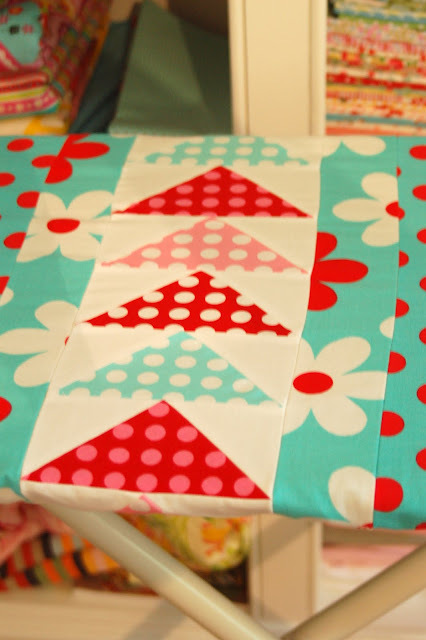 :) I bought this ironing board cover pattern because I loved the patchwork sections. 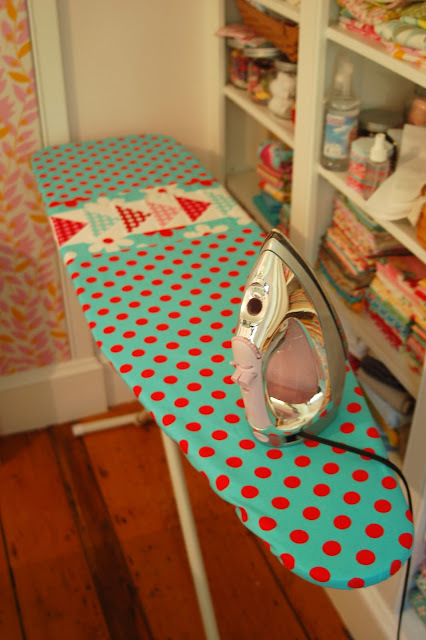 There are lots of free tutorials on how to make a new ironing board cover but I have to admit that it was really nice to have full size pattern pieces and all of the measurements worked out. Crazy, I know, I warned you that it was an impulse buy! I LOVE my new cover!! It's fun and colorful and makes ironing a little more enjoyable! There are 3 layout options in the pattern and I chose the flying geese. They look a little wonky in this picture but it's just because I didn't straighten out the cover properly. Oops! It came together really easily, the only thing I changed was that I made the ribbons (you tie the ribbons underneath to cinch up the cover) a little longer so that they didn't get lost in the casing. The hardest part was getting the sucker on my ironing board. I also made another little fussy cut pencil pouch. These are so fun to make! Yes, more hand stitches! They are totally addictive and I think the little extra effort really makes it special. 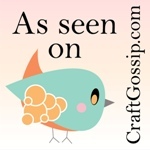 The fabulous Jeannie has requested a tutorial for these pouches. I know there are tons of zipper pouch tutes out there but a request from Jeannie just can't be ignored! :) I will try and have it up sometime next week. Oh my gosh I love the cover!! I go through those so fast I wouldn't waste my time but I might make one for my sister. Love the pouch!! I think I have some cute fabric for something like that :) I need to sew, I've been knitting! Very nice ironing board cover! It is so sharp and bright!!! That ironing board cover is so cute! But as Jeannie said, I go through them so fast and I'd be devastated to scorch or stain something so pretty. Does the pattern call for any padding or a heat proof layer?